Seva Kendra Arunachal East, the social service wing of the Diocese of Miao responded to the health emergency in the interior villages by two free health camps in Muktuva and Chanu villages of Tirap and Longding Districts of Arunachal Pradesh on on 21st & 22nd July, 2014, in Muktuva and Chanu villages of Tirap and Longding districts of Arunachal Pradesh. Health Camps are immediate solution while addressing continued health issues in rural areas. Sometimes health care services are either out of reach or a “health-seeking behaviour’ is below average in this region. Seva Kendra Arunachal East has been catering to the manifold needs of the people in this region, undertaking projects for the welfare and the upliftment of the people. ‘Health’ has been the core issue, and the focus to attend to this issue is the prime need. Seva Kendra is showing its credibility and efficiency by reaching out to the hundreds of people who haven’t yet got relief in the aspect of health; it is trying to bring in a drastic change in their lives, and in turn, in their families. Modern diagnostic techniques, quality doctors and surgeons and other advanced medical facilities are beyond the reach of these our impoverished people. With all these inconveniences and difficulties it would be very difficult for the indigenous people to have access to various medical check-ups and other medical facilities. 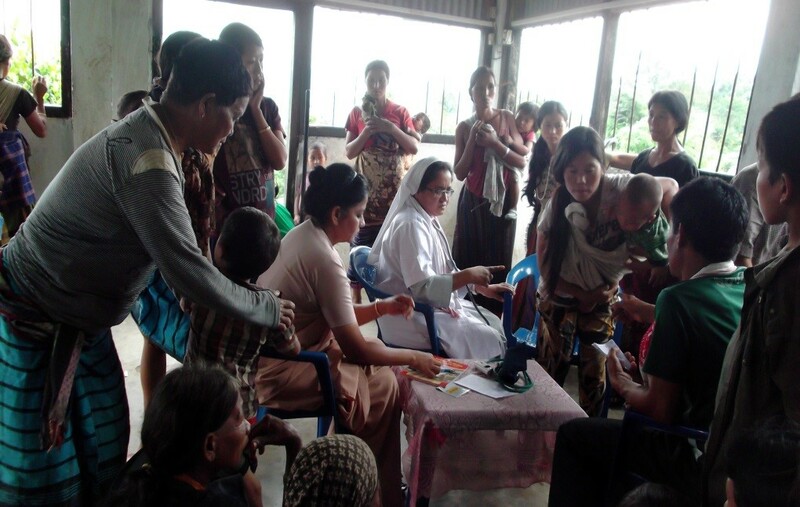 Two intensive free health camps were conducted on 21st & 22nd July, 2014, in Muktuva and Chanu villages of Tirap and Longding districts of Arunachal Pradesh. In the first week of July we received the information from these villages that seven people died and many were suffering from Diarrhea, Malaria, Jaundice, Pneumonia fever, stomach problems. 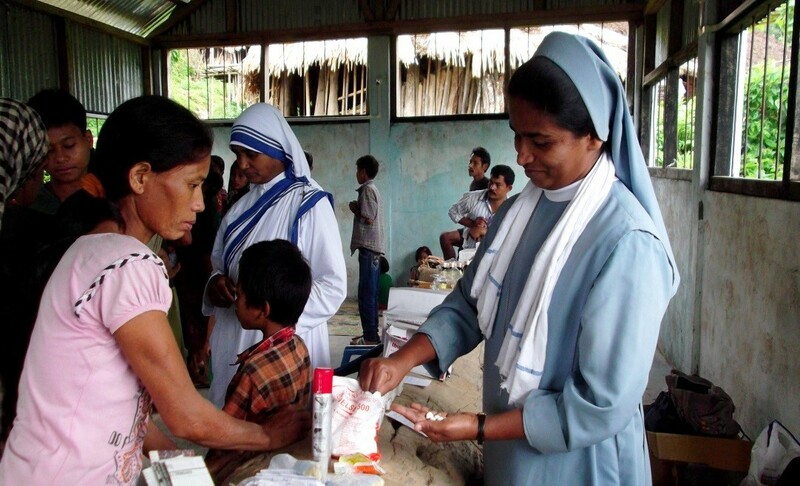 As soon as we got the information, Seva Kendra Arunachal East, under the direction of Bishop George Pallipparambil and with the cooperation from the Health Commission of the Diocese decided to reach out to these people with medical care. Seva Kendra could successfully organize the camps with the team of Nurses from Health Commission of the Diocese of Miao. The team included eight members, Sr. Ancy, the Health coordinator of the Diocese of Miao, the Mothers Theresa Sisters from Khonsa, Holy Spirit Sisters form Senua and Sr. Rincy the director of Seva Kendra who headed the team. There were 260 patients at Matktuva village coming from various villages nearby. The nurses had the check-up done and they gave the medicine to all the patients. In Chanu village there were about 160 patients given treatment and medicine. In these health camps, not only medicine was given to the sick but also awareness was given on various aspects of health and hygiene. The main highlight of these camps was the talk given by Sr. Ancy. She explained to the people about the prevention of various hazardous diseases, including Malaria. The people were made aware of the different methods of prevention from Malaria too with the help of slideshows and group discussions.